INDIANAPOLIS – Before the Indiana Pacers' Lance Stephenson had time to study an endless scroll of congratulatory texts on Saturday night, there promised to be a most meaningful message awaiting him. Out of sight this season, Larry Bird has never been out of touch. As Pacers president three years ago, Bird drafted a dysfunctional 19 year old and surrounded him with the perfect balance of tough love, structure and tenderness. As everyone else derided Stephenson as a lost cause, Bird privately called him the most gifted player in the franchise. 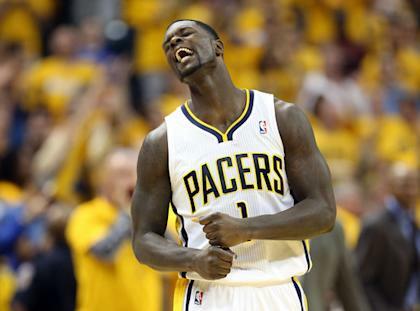 "I owe Larry Bird so much," Stephenson told Yahoo! Sports late Saturday. Bird left the franchise for his Florida home at the end of last season, but the kid has stayed strongly in Bird's mind and heart. Stephenson was standing in an emptying locker room at Bankers Life Field House, on the way to the Eastern Conference finals with the game of his life complete: 25 points, 10 rebounds and three assists. The New York Knicks had gone down in Game 6 on Saturday night and Stephenson – out of the mayhem of schoolboy celebrity in Brooklyn's Coney Island – had delivered one devastating blow after another in the final minutes of a 106-99 victory. "He believed in me," Stephenson told Y! Sports. "He gave me the confidence that I could play in the league. Larry is a legend, and when he tells you that you can do this, and do that, it just boosts your confidence, makes you feel like no one can stop you." Finally, it happened. No one could stop Lance Stephenson on Saturday night. 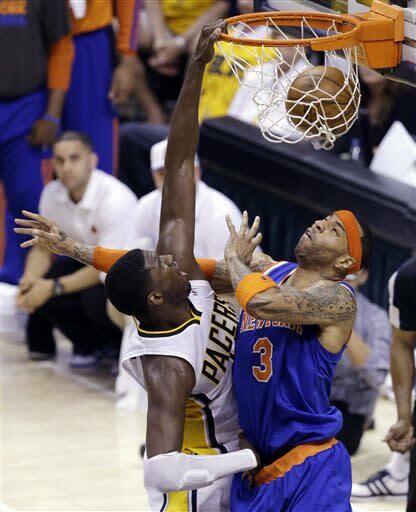 When the uncertainty of a Game 7 at Madison Square Garden hung like an anvil over these Pacers, when the Knicks had come marauding back to take a fourth-quarter lead, Stephenson validated his benefactor's vision with the biggest plays in the biggest minutes of the season. Stephenson changes the dynamic of meeting the Miami Heat in the Eastern Conference finals. He changes everything for the Pacers. He's resilient, resourceful and a strong, strapping 6-foot-5 to take on LeBron James and Dwyane Wade. "His talent is incredible," David West said. "We see it every day. When Lance plays well, we win. He got us over the hump in this series." One year ago, Stephenson was considered a clown, a punchline, a downright embarrassment within a mature locker room. In a conference semifinal game against Miami, the television cameras caught Stephenson hurling a choke sign at James. For the rest of the series, Heat players took turns chasing down Stephenson and hitting him in his brief cameos on the floor. "He's grown up," West said. Bird used to bring Stephenson into his office, or sit down with him post-practice and talk to him. "Learn everything, learn, learn, learn,' Larry used to say to me," Stephenson told Y! Sports. " 'Watch the games,' he would tell me. 'Don't just sit and take these games for granted. I listened to him. I watched the other players that were in front of me, and I took what they did and tried to put in my swag." Before Bird believed in Stephenson, there was a scout: Kevin Mackey. Bird believed in him too. He had rescued Mackey out of oblivion, out of a scandalous ending to a brilliant coaching run with Cleveland State in the 1980s. After a decade of coaching championship teams in bush leagues from Atlantic City to South Korea, there finally came a chance to find the kinds of hard-edged, hungry players that his coaching lived on. Bird used to ask people: Who's the best basketball mind not in the NBA, and people would come back to him: Mackey. Ten years ago, Bird hired Mackey to be a scout for the Pacers. Of the all the talents these Pacers scouts brought into the franchise – from Paul George to Danny Granger – few fascinated Mackey like Stephenson. Mackey watched him dominate end-to-end at the LeBron James Skills Academy as a high school senior, so strong with the ball, so fearless on the move. Mackey watched snippets of Cincinnati college practices where the coaches gave Stephenson the ball and let him run the team. The dominance mesmerized Mackey. He traveled to watch Stephenson a half-dozen times during the Bearcats' 2009-10 season and projected him a playmaker in the pros. Mackey sold Bird on Stephenson, and the Pacers' 2010 depth board had him as the ninth most-talented player in the draft. With the 10th overall pick, Indiana selected a future All-Star – George. For the rest of the night, the Pacers were offering $2 million to purchase a pick to move into the late first round. They desperately wanted Stephenson, but felt convinced he'd never be there for them in the second round. When the Knicks had the 38th and 39th picks, the Pacers believed they would use one of those picks on the wildly talented kid out of Lincoln High School in one of the city's boroughs – only the Knicks selected Andy Rautins and Landry Fields. At No. 40, the Pacers executives cheered: Somehow, a lottery-level talent had dropped to them. Now, Stephenson is one of the two youngest players in the Final Four of the NBA season. For perspective, he belongs in the class of seniors that Pacers executives have been interviewing for the past three days at the draft combine in Chicago. For all the talk about player development in the NBA, too few franchises are equipped to properly grow the talent and character of its players. Had Stephenson gone to an unstable franchise, he'd probably be out of the league by now. As the Pacers prepared to attend the post-game press conference, the franchise's five starters began walking out of the room and a few feet down the corridor. Only, Stephenson seemed to have forgotten something. "Hey Lance," an official yelled. "You've got to put your pants on." Walking past, Pacers coach Frank Vogel let out a laugh. He's done such a magnificent job bringing Stephenson along, forcing him to earn his minutes, earn his opportunities. This is Stephenson's third season in the NBA, and make no mistake: It's taken the Pacers' whole operation to raise him. Now, the Pacers come for the Heat in Game 1 on Wednesday on the shores of Biscayne Bay, and no one comes harder than Lance Stephenson. He changes everything for this team, and rest assured Larry Legend will be pounding those text message into his phone, searing them into the mind of Lance Stephenson. "He texts me and he'll ask me, 'What's the plan for next game?" Stephenson told Y! Sports. The plan seems set now: This time, the kid's coming for the Heat with his game – not his mouth. Larry Bird believed in Lance Stephenson and it makes him feel like no one on the planet can stop him. Finally, it was true on Saturday night. From the scout to the legend, this was the night Lance Stephenson validated visions.